I do not like being wasteful. I believe in the motto/lifestyle of ‘waste not, want not’. Unfortunately, no matter how hard I try I have a tendency to waste more food than I would like – its that whole bit about not being able to count, there is only ONE of me and I can only eat so much. I find that my eyes are much larger than my stomach. It is a problem that many in the world would love to have and here I am blogging about it…in short, ridiculous. These aren’t getting tossed…trust me! So what and how much do I throw out? It generally is the last few salad greens that have gone and gotten slimy, or the last of the cottage cheese that looks a bit like curdled cottage cheese, or the last few slices of bread. Nothing crazy, but still wasteful. My most wasted item, something I waste almost daily (lately, I go in spurts), is – drum roll please – egg yolks. Laugh all you want but it kills me every time I toss one of those golden yellow yolks into food hell. What have they done to deserve such a harsh exit? You see, I start off every day as healthy as possible and as of late that has been with an egg white omelet/scramble stuffed with some sort of vegetable (excellent way to eat that extra produce). Why no yolk? Well, mainly because every fitness/health/journal/magazine suggests eating such things (i.e. egg whites) will help to maintain/obtain healthy living. Maybe its all crazy talk, or I am a yuppie, either way I enjoy my egg white breakfast. This is not to say I don’t love yolks – nothing better than a hard-boiled egg every now and again, but for the most part, I eat egg whites only. So what is on the menu for the yolks I saved from yesterday? 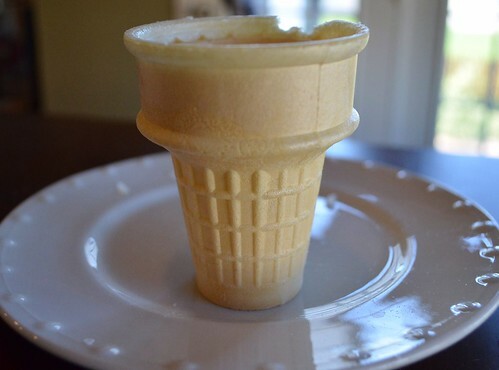 *egg yolks can be stored in a covered container in the fridge for 2 to 3 days, just add a bit of water * Ice Cream! ( I hope you had assumed as much) I just bought an ice cream machine, its warm outside, an abundency of egg yolks….just makes perfect sense. Next step is the fridge to completely cool…. Strawberries are now in season and what is more refreshing after an evening of playing in the sprinkler, mowing the lawn, or a little league baseball game? 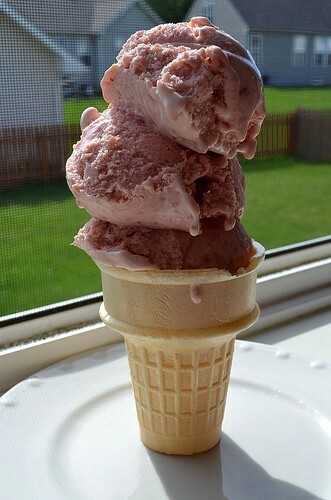 Yep, that is what I was thinking – strawberry ice cream! In a blender or food processor (can also be done by hand!) 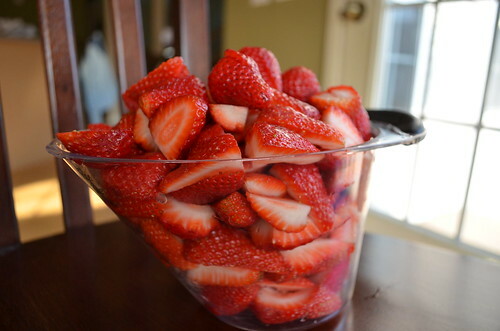 add the strawberries and 1/2 cup of sugar. Pulse until its a chunky puree. 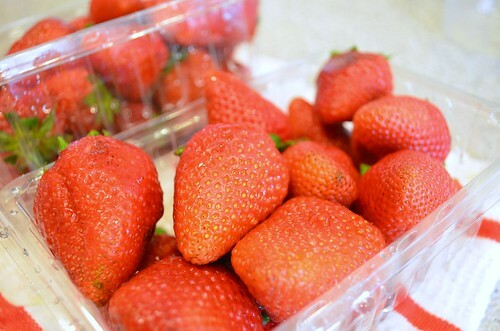 Puree until the consistency you like for a strawberry ice cream. 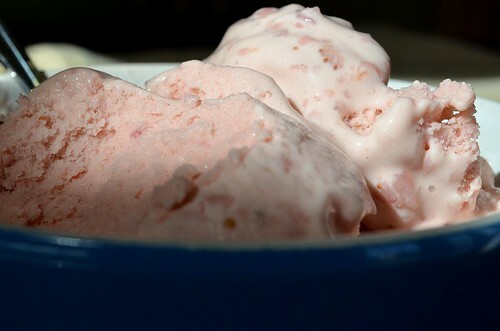 If you like chunks of strawberries in your ice cream, then don’t completely puree the mixture. Set aside. 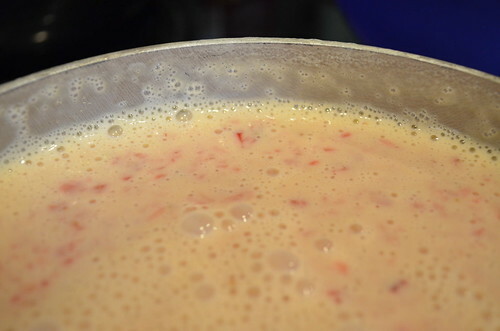 In a medium sized pot over medium heat, warm the half and half until it begins to steam and tiny little bubbles form on the edges. While the half and half is warming whisk together the egg yolks, 1 cup of sugar, and vanilla set aside. 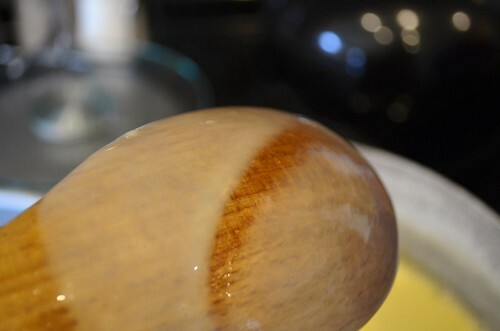 Once the half and half is ready, slowly add the half and half to the egg yolks and whisk until combined. Add slowly so you don’t end up with scrambled eggs on your hands. Once combined, pour everything back into pot and place on medium – low heat and cook for 10 to 15 minutes, stirring constantly with wooden spoon, until mixture has thickened and it coats the back of the wooden spoon (see above picture). 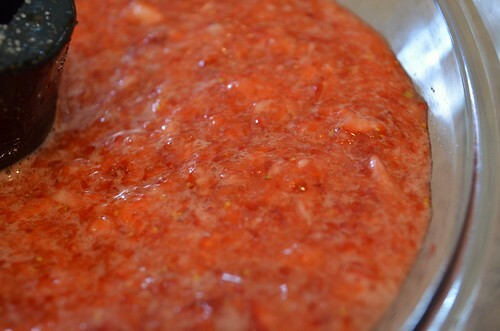 Remove from heat and whisk in strawberries. Cover with plastic wrap – place wrap right onto the surface of the liquid, preventing a film from forming. Can be eaten straight from machine or stored in freezer to become more solid. Thanks Aunt Sue for the lovely bowls! Love them and you! 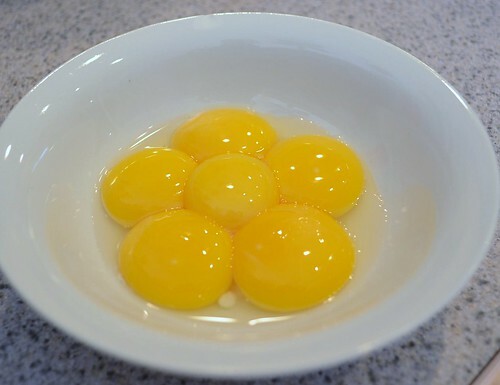 I just realized that with all the egg yolks I can round up in a week, I might be headed for an ice cream manufacturing business…maybe I should switch to cereal.